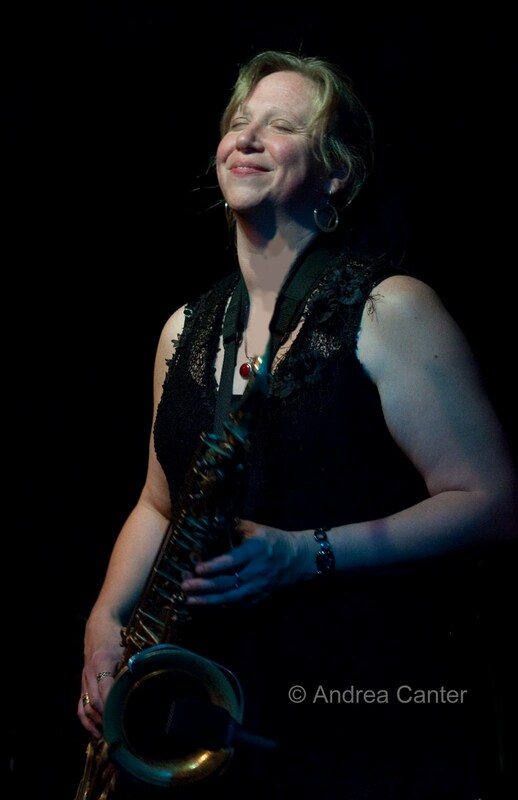 She was once known as “Seattle’s Best Horn,” but tenor saxophonist Sue Orfield, now based in Eau Claire, WI, should have recognition far beyond either locale. Playing this past weekend at the Artists Quarter with an organ trio already known for its playful, zesty firepower—the Tuesday Night Band—Orfield turned up the heat beyond boil. The TNB+1 didn’t sizzle, they nearly vaporized. If there was a grin meter to measure artist satisfaction, then B-3 man Bill Brown, guitarist Billy Franze and drummer Kenny Horst were off the chart. Why has it taken so long to put this jazz-holy union in place? Orfield keeps busy with diverse projects from blues to sax quartet to her own soulful jazz ensemble in western Wisconsin, but it’s only a couple hours to the Twin Cities. Sue brought her own band to town last June for the Twin Cities Jazz Festival, and tongues are still wagging, ears still (happily) ringing. And now, with these two nights of relentless artistic combustion, we have to expect a long-standing collaboration is in the making. Orfield is one of the most powerful, most songful, most spirited tenor players I’ve heard. And her art, and her joy, went viral at the AQ. Let it spread far and wide.